"I've been trying to find a simple process to convert a TS file to a working MKV file (1080 or 720 would be fine) for archiving purposes, but have had nearly no luck with that process (having used FFMpeg, but no actual usable result). Any help?" Have tried some tools to convert video from TS to MKV, but errors generated or a get heavy-quality loss video? Don't worry. This article covers some suggestions or directions to help you convert TS to MKV losslessly. As we know, The TS (short for transport stream) file format is used in many DVD, Blu-ray and home video discs. While the discs offer great quality, the TS file container is not always compatible with your computer, home theater PC or media player, like PopCorn Hour, WDTV, VLC, Windows Media Player. To fix this, all you need to do is change TS to a more accepted container like the MKV. To transcode TS file to MKV without quality loss, Brorsoft Video Converter would be the best choice. With it, you can transcode TS to MKV maintaining as much of the original HD quality as possible. Besides, this video converter is able to convert any video files from any SD/HD/4K format (including AVI, H.265, MP4, MOV, MKV, WMV, 3GP, MPEG, SWF, FLV, MPG, ASF, AVCHD, H264) to other format you want. What's more, you also convert your videos directly to iPad, iPhone, PSP, android phones, Amazon Kindle Fire, etc. 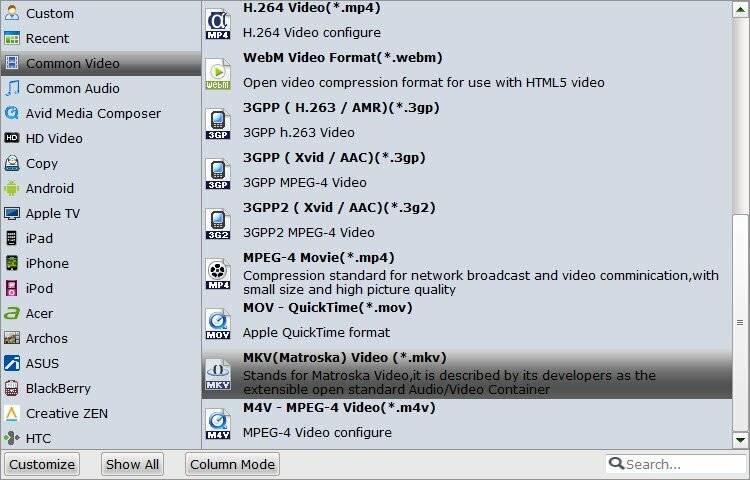 And if you are a Mac user, please get Brorsoft Video Converter for Mac, which helps you encode TS videos to MKV on Mac OS X(El Capitan, Sierra, High Sierra included). Now we share the step-by-step solution converting TS files to MKV. Launch the best TS to MKV converter. Click "Add files" on the top tool bar, or simply drag and drop to import the videos. Click on the output format selector on the lower part. There are many built-in profiles for popular devices. To convert TS to MKV, click "Format" bar, and select .mkv from "Common video" or "HD video" profile. Click the "Convert" button on the main interface and the software will start to convert TS to MKV format immediately. When the conversion finishes, click "Open" to find the converted video files. Your movie file can now be played in many more different players because of the wide use of the MKV format.